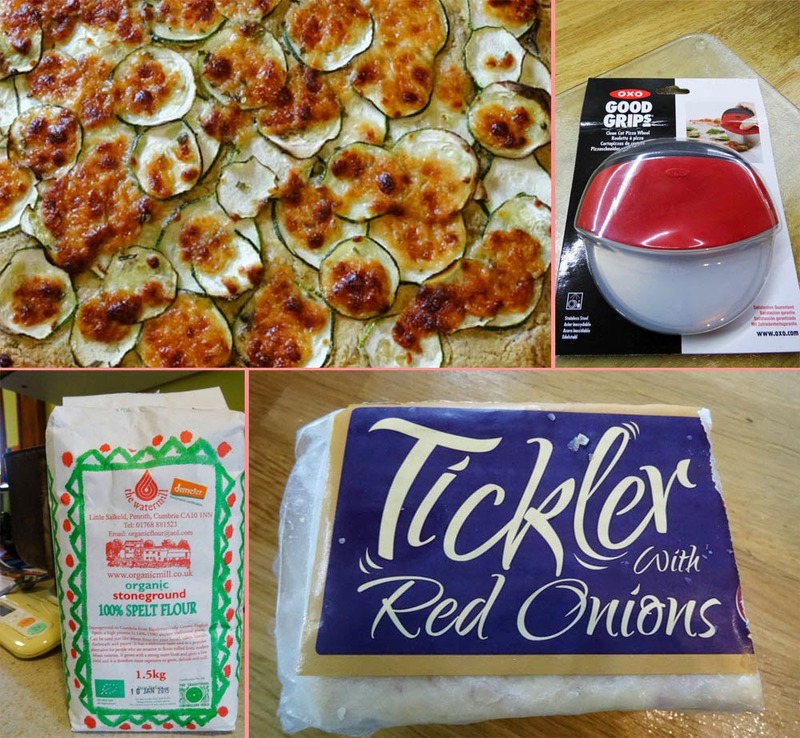 I saw a photograph of a Courgette (Zucchini) and Hummus Pizza on Pinterest, unfortunately the link went to a blog that was private so I wasn't able to get the recipe, however I was intrigued by this unusual topping, so decided to have a go myself. Having recently returned from Appleby and the Lake District via Little Salkeld Mill, near Penrith, where you can see the flour milled, enjoy the delights of the cafe and stock up on all the organic goodies. This quantity of flour will make one large pizza and three flat breads or two large pizzas. Just half the quantities if you only want enough for one pizza. I made my dough in the bread maker, but if you want to make it by hand, put all the ingredients in a large bowl and add the salt and the yeast keeping them away from each other. Add the olive oil and 150ml of the water and mix. Add the remaining water a little at a time until you have a smooth, soft dough. Split off enough dough for your pizza and roll is or press it onto a tray, spread the hummus in a thick layer over the dough, place the slices of courgette over the hummus. Crumble the mature cheddar and scatter over the pizza. Cover the pizza with oiled cling film and leave to rise for a further 30 minutes. Bake at 200C for 20-30 minutes until the base is cooked, the courgettes have crisped and the cheese is melted and golden. The combination of the hummus and courgette was absolutely brilliant! The spelt base was soft rather than crispy but full of flavour, the red onion in the cheese also worked well with the combination, but you could add some finely chopped red onion to the topping to compensate if you don't have this cheese. I had the opportunity to try out the new Clean Cut Pizza Wheel from OXO Good Grips, so here is the result, it was easy to hold and cut through the topping and base with ease. I also liked the plastic cover for the sharp blade although it can be a little tricky to get the cover off! See the pizza cutter in action in this little video. Wow, I really fancy this, sounds great - I bet the courgettes and hummus go perfectly together, but I never would've put them on a pizza... I've made some preserved lemons that would go perfectly with it too ;-) Thanks! Yes, indeed Kate. Although it only uses on courgette, but is super tasty so well worth making. Never thought of preserved lemons, but you are right it would work really well. This is certainly a courgette summer - Always good to see another recipe to try to use up the allotment glut!! What a great way to use up the summertime glut of courgettes. I'd never have thought of topping a pizza with hummus but it sounds like a fantastic idea. Can't wait to try it! such an odd idea but I can totally see this working... whilst we were in Italy this last week I saw loads of Pizza Bianca which is basically pizza with white sauce and they're crazy for zuchini out there too. I really love this! Oh that does look mouth-wateringly good Janice. I like the look of that cutter too! I felt the same way, but it seemed like such a simple idea and it works sooo well. You have to try it Dom, it's genius!